Cloud. Big data. Analytics. Mobility. The Internet of Things. Social collaboration. These are just some of a wide variety of technologies that are unlocking unprecedented innovation and transforming every aspect of business operations. However, for CIOs, this new development can be more of a headache than a blessing. Enterprises have long relied only on private networks to give their subsidiaries, branches, or stores secure, high-performing, and highly available access to applications residing within their private data centers. However, the capacity of enterprise networks is in higher demand as data requirements increase due to rising use of videos, guest networks, IoT data, and time- and latency-sensitive applications such as voice and secure transactions. Traffic intended for the cloud is now taking an out-of-the-way route to its final destination. While it would be easy to resist deploying a cloud platform or any other high-connectivity technology, I have yet to meet a business that can afford to sacrifice the potential of these investments. Could SD-WAN be the missing link to seizing the benefits of today’s latest technology while maintaining the control, reliability, visibility, and security that enterprises value most? Known as “software-defined wide area network,” SD-WAN promises to revolutionize how businesses connect with their distributed chain of physical locations. It simplifies and accelerates enterprise connectivity by combining multiple branch links with intelligent traffic directing across those links and with the policy-driven management of the WAN. Uniting public internet, cellular, and private MPLS network links to a remote location with a single, virtual, and high-capacity source for all applications and services while fully controlling the links. Customizing the enterprise’s bandwidth and connectivity to deliver specific network services to individual or a group of locations and users. Defining and managing policies and network traffic from a central location, eliminating the need to configure each device manually. 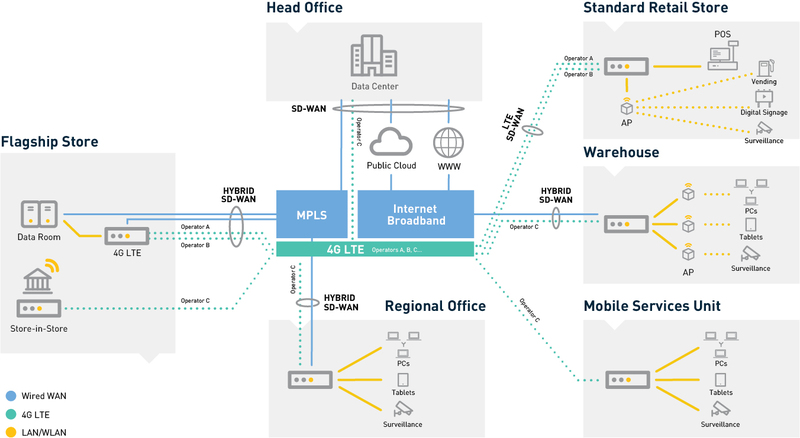 Whether SD-WAN is deployed over the public internet, on LTE, with a mix of MPLS, public internet, and LTE links, or through a cloud-based private network, businesses can dramatically lower the cost of their WAN services and reduce outages. More importantly, employees and partners in remote locations gain the transparent, collaborative, and knowledge-rich environment they need to succeed. Wireless networks have evolved dramatically with LTE. Operators around the globe have been upgrading at such as rapid pace that growth in traffic demand exploded along with the increasing consumer appetite for social media and data-intensive applications. LTE-advanced technologies and wireless networks can now offer peak data rates of over 1 Gigabit per second (Gbps), which exceeds well beyond the data rates provided by traditional public internet options such as DSL. In the near future, 5G will usher in a new era of super-high data rates and ultra-low latency. Clearly, wireless technology has outpaced wired technology to the point that enterprises are finding it difficult to ignore. Early enterprise use cases for wireless include LTE failover. But with ubiquitous coverage, increased network throughputs, and sub-10ms latency, it has the power to become the primary connection for distributed enterprises. LM940: The LM940 Mini PCle (mPCle) data card enables high-speed data rates through an advanced LTE and offers a cellular connection for products operating in network appliance environments. Designed for products that require high throughputs such as routers, mobile gateways, and access points, the data card ensures a rich and seamless user experience by tapping into the advanced connectivity of 4G LTE. Plus, LM940 is LTE-advanced because it uses LTE Category 11 to support download rates as high as 600 Mbps and uploads as fast as 75 Mbps. LM960: The LM960 Mini PCIe (mPCIe) data card provides everything the LM940 mPCle delivers, but it is an LTE Category 18 device. Designed for networks that require 2x the data rate speed offered by LM940, the LM960 provides download rates up to 1.2 Gbps with 4x4 MIMO +3 CA and 1 Gbps with 2x2 MIMO + 5CA. It supports the Citizens Broadband Radio System (CBRS) and License Assisted Access (LAA) to enhance performance inside campuses, small cells, and buildings leveraging either technology to augment cellular service. LM960 also includes support for band 14 for U.S. FirstNet public safety products and brand-new life-saving applications. LE910: The LE910 mPCIe data card addresses the convenience and short development cycle associated with a standard such as mPCle, which can sometimes be more important than speed. Supporting Category 4 and Category 1, this addition of LE910 Cat 1 and LE910C1 mPCIe to the data-card portfolio powers speeds as fast as 10/5 Mbps DL/UL and provides a VoLTE support option for applications requiring voice. The LE910 V2 mPCIe card is an LTE Category 4 device rated at 150/50 Mbps UP/DL speed, also supporting VoLTE. The LM940 and LM960 data cards both support global navigation satellite systems such as GPS, GLONASS, Galileo, and Beidou. These Telit data cards can help your business overcome the complexity, high costs, and bandwidth limitations of today’s LTE services. For you, this means real-time, high-quality data exchange across cable, DSL, fiber, and 4G with policy-based routing to application-specific traffic. No more latency, no more limited connectivity, and no more lost data. Just direct internet access with connectivity guaranteed with a service level agreement and a seamless extension to cloud data centers and mobile devices. Please email us at sales@glyn.com.au for more information.